Mettler Toledo announces the launch of its new, fully certified InMotion KF oven autosamplers: InMotion Flex and InMotion Pro. These instruments have been designed to bring accurate, precise, and efficient Karl Fischer titration to every laboratory. The InMotion KF comes with an innovative vial with a new one-piece screw cap that enables safe and fast sample preparation. An automatic gas flow meter gives the operator complete control over gas flow entering and leaving the titration cell. Time spent analyzing substances can be reduced by hours with the Temperature Scan function. This feature speeds up sample analysis by determining the substance's ideal heating temperature in one run. The InMotion KF can also run up to 120 samples in one series without stopping, improving workflow productivity and ease of use for everyday tests. With an ergonomic and space-saving design, the InMotion KF allows up to 26 samples to be analyzed on a 25-cm platform. The InMotion KF Pro offers three platforms and vial sizes to choose from, providing a solution for laboratories of all sizes and industries. Customized platforms can be designed for labs with additional needs. The procedure calibrates both the oven temperature and the gas flow rate to the titration cell, complying fully with current OMCL guidelines (Qualification of Automatic Titrators, 2016). Everything is documented with professional, easy-to-read certificates. Additionally, Mettler Toledo provides service and support of the new KF oven through its entire lifecycle, offering the same high standard of service as for the titrator. 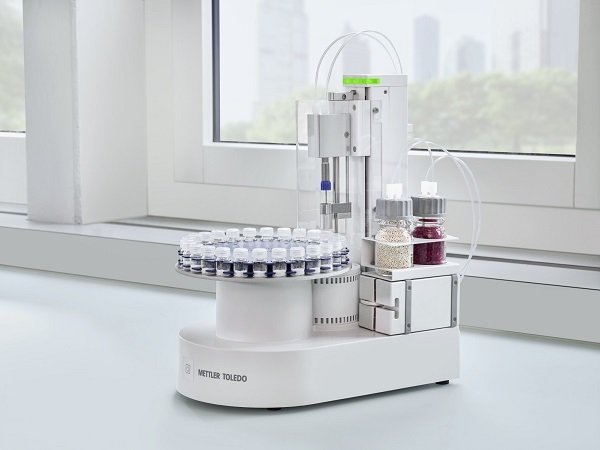 InMotion KF Flex and Pro connect to the latest versions of Mettler Toledo volumetric (V30S) and coulometric (C30S) Karl Fischer titrators, as well as to the modular T7 and T9 excellence titrators. The InMotion KF oven autosamplers are available now.